Wild Carrot or Poison Hemlock? Several months ago, my brother and I were discussing our mutual love of the woods and the outdoors. Although he has hunted and fished most of his adult life, he admitted that he really didn’t pay too much attention to the wild greens around him. Somehow, our conversation turned to the subject of Hemlock and my brother was quite surprised to learn that Hemlock trees were not poisonous, but several relatives of Wild Carrot are some of the most deadly plants in North America. Their similarity in appearance to Wild Carrot has resulted in many deaths, including children using their hollow stems for straws or for making whistles. My brother was also surprised to learn that sometimes Wild Carrot and Poison Hemlock can grow in the same areas and that Poison Hemlock can be found growing right in your own backyard. Wild Carrot, Poison Hemlock and Poison Hemlock’s deadly cousin, Water Hemlock all belong to the Apiaceae plant family. Formerly known as the Parsley or Umbelliferae family, the Apiaceae family includes cow parsnip as well as many well-known edible plants such as celery, parsley, angelica, fennel and sweet cicely. Although many of these edible plants are cultivated, they can still be found growing wild. It is important to note that the non-poisonous Hemlock tree, Tsuga, is not related to the Hemlock plant. Personally, I never wildcraft any plants from the Apiaceae family. In my opinion, the potential for making a deadly mistake is far too great. 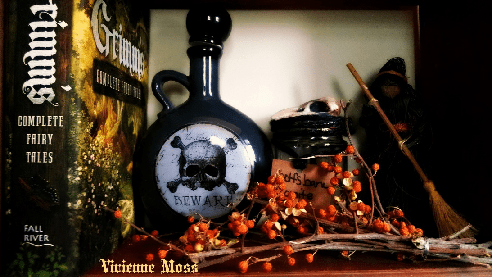 I am honest enough to admit that I just do not feel comfortable or 100% certain in recognizing the differences between the edible and the deadly-poisonous varieties. If you ingest either Poison Hemlock or Water Hemlock, it is very unlikely that you will get a second chance to get your plant identification right the next time. 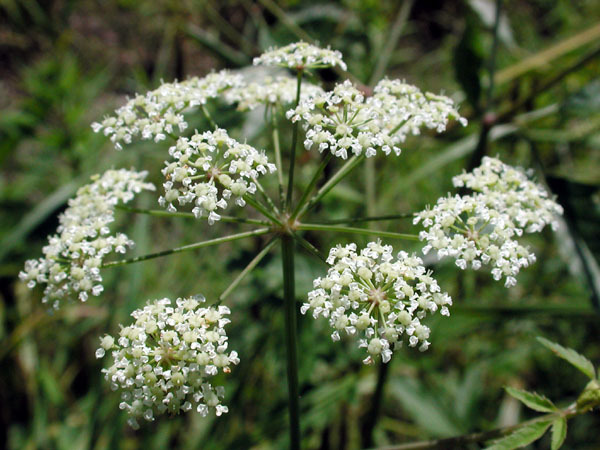 According to tradition, it was the Poison Hemlock plant- Conium maculatum that was used to execute Socrates. What can make identification difficult is that although Wild Carrot and its edible relatives do have some fairly recognizable differences from Poison Hemlock and Water Hemlock, like many plants, these characteristics can be affected by variations in growing conditions making accurate identification sometimes difficult. It is important to remember when harvesting edible wild plants to be aware of what other plants are growing in close proximity, as poisonous plant neighbors can ‘share’ their toxic constituents with nearby plants. To avoid potential contamination, never harvest any plants growing in the vicinity of Poison Hemlock, Water Hemlock or any other poisonous plant. Let’s look at some of the characteristics for Wild Carrot, Poison Hemlock and Water Hemlock. Wild Carrot, also known as Queen Anne’s Lace, was introduced from Europe as a medicinal plant; the vegetable carrot was bred from this plant. The root, flower and seeds are all edible and medicinal. Wild Carrot is often found in dry fields and along roadsides, flowering from May to October. Growing an average height of 1 to 3 feet, it has tiny white flowers arranged in compound umbels-flower clusters in which individual flower stalks arise from the center. These umbels average 3 to 5 inches across. The center flower is often purple and the leaves are very finely divided (tri-pinnate), arranged in an alternate pattern and embrace the stem with a sheathing base. The root is small, spindle-shaped with a strong aromatic carrot smell. Distinctive features: Unlike Poison Hemlock and Water Hemlock, Wild Carrot has a solid stem which is covered with short coarse hair. Remember: “Queen Anne has hairy legs”! Poison Hemlock is found in areas of moist fertile soil, in wooded lots, along fences and in waste areas. Unlike Wild Carrot, Poison Hemlock grows tall-between 3 to 6 feet high. It has small, white flowers in compound umbels with alternate, finely divided leaves with bases sheathing the stems. Poison Hemlock has a large taproot, white to yellow in colour. The entire plant is toxic and if you need to work with it, be sure to wear protective clothing. Distinguishing features: The leaves have a mouse-like odor when crushed and are extremely nauseating when tasted. The stems are smooth, hollow and often covered with purple reddish spots or mottling. Water Hemlock grows in open wet areas such as marshes, along shores and sometimes in open swamps. 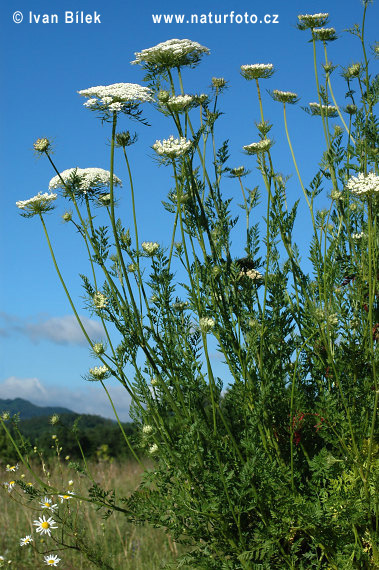 Like Poison Hemlock, Water Hemlock grows tall-3 to 6 feet or higher, with flat or rounded white umbels, 2-5 inches wide. The leaves are alternate, pointed and lance-shaped with numerous teeth; they are sometimes red-tinged. The roots have fat tuber-like branches. One of the most poisonous plants in North America, even a small mouthful of Water Hemlock can kill an adult. Always wear protective clothing if you need to work with this plant. In Amy Stewart’s book, “Wicked Plants”, she tells of two brothers who, in the 1990’s during a hike, mistakenly identified Water Hemlock for Wild Ginseng. One man ate three bites and died several hours later, while the other took only one nibble, developed seizures but survived. She also notes that the roots have a slightly sweet taste, which may make the plant seem edible. Distinctive features: The whole plant has a ragged look. The stems are hollow, smooth and branching, often with purple reddish mottling. The lower part of the stem is chambered. If you feel called to work with the medicinal properties of Wild Carrot or wish to wildcraft other edible members of the Apiaceae family, consider taking a class taught by an experienced teacher which includes hands-on plant identification as part of the course work. While field guides are extremely helpful tools in plant identification, it is important to be introduced to the members of this family face-to-face by a knowledgeable instructor to avoid a potentially deadly mishap. -Stewart, Amy. Wicked Plants. Chapel Hill: Algonquin of Chapel Hill, 2009. Print. Spray windows with preferred cleaner solution then wipe clean with crumpled newspapers. The newspaper helps prevent streaks. Avoid cleaning windows and glass when the sun is hot and shining on the window–glass will dry too fast and there will be streaks. Also wash one side of the window in an up and down direction, on the other side scrub side to side. This will help determine which side of the glass has the streaks that need to be polished out. If you add an extra ½ cup borax and a ½ cup salt to 1 ½ cups liquid detergent you can make a great soft scrub. Add Borax to a 1-quart spray bottle. Add Castile soap and 15 to 20 drops of oil. Add any fragrance oil that you like! Take your bar of soap (we use Dove or store brand like it, because it’s more moisturizing), and grate it with a cheese grater. Pour the water and grated soap into a microwaveable container and cook on high for 3 min. Remove and stir until all soap bits have melted (put in a bit longer, if needed). Let it cool, then pour into pumps (leftover from store bought liquid soap), and the remainder in any container with a lid. Makes about 24 oz. Warm the water and pour into a ceramic bowl. Add the apricot kernal oil, salt, peach fragrance oil, vitamin E oil (just break open the capsules) and coloring. Stir until well blended and thick. Pour into a squeeze bottle and close. Scalp very clean and healthy and helps prevent dandruff.